Two seniors in the University of Maryland’s College of Computer, Mathematical, and Natural Sciences (CMNS) have been awarded 2018 Winston Churchill Scholarships, which offer full funding to pursue one-year master’s degrees at the University of Cambridge in the United Kingdom. Nationally, 15 students in the sciences, engineering or mathematics receive Churchill Scholarships annually. Only two UMD students previously received the award since its inception in 1963, and this is the first time two were selected in the same year. The scholarship—valued at $50,000 to $60,000—covers all educational fees and provides living and travel allowances. Christopher Bambic—a physics and astronomy dual-degree student, who is a Stamps Banneker/Key Scholar and a member of the University Honors program within the Honors College—will pursue a Master of Philosophy degree in astronomy. He plans to study the connection between microscale plasma physics and macroscale astrophysical phenomena. Yousuf Khan—a biological sciences major specializing in cell biology and genetics, who is a Banneker/Key Scholar and a member of the Integrated Life Sciences program within the Honors College—will pursue a Master of Philosophy degree in pathology. He plans to study programmed ribosomal frameshifting in eukaryotic organisms. This mechanism allows organisms to pack a larger amount of genetic information into a relatively short sequence of RNA. Following their time in Cambridge, both Bambic and Khan plan to pursue doctoral degrees in the United States and ultimately pursue academic careers. The Churchill Scholarship will allow Bambic, a 2017 Goldwater Scholar, to combine his unique experiences in astrophysics, plasma physics and astronomy to conduct both theoretical and experimental research at the University of Cambridge. There, Bambic will work with Christopher Reynolds, a professor of astronomy at UMD who was recently named Plumian Professor of Astronomy at the University of Cambridge, and Andrew Fabian, director of the Institute of Astronomy at the University of Cambridge. For two years, Bambic conducted research with Reynolds examining the physics of the plasma that surrounds clusters of galaxies and the role magnetic fields play in active galactic nuclei feedback. Bambic is working to develop a theory of how energy is transferred from supermassive black hole jets to the hot plasma surrounding galaxies. He spent last summer at the University of Cambridge in Fabian’s lab using X-ray spectral data collected by an instrument aboard the European Space Agency’s XMM Newton space telescope to research the roles of turbulence and sound waves in heating the plasma in galaxy clusters. He received an Undergraduate Summer Research, Travel and Educational Enrichment Award from the CMNS Alumni Network to pursue this work. “I am interested in using supercomputer simulations, analytical work, and X-ray and gamma ray observations to elucidate the complex physics of systems such as black holes, astrophysical jets, gamma ray bursts and the hot intracluster medium in clusters of galaxies,” Bambic said. Bambic has also studied the dissipation of sound waves within plasmas with UMD Physics Professor William Dorland and conducted research on the High Altitude Water Cherenkov (HAWC) Gamma-Ray Observatory with UMD Distinguished University Professor of Physics Jordan Goodman. A graduate of Saint Ignatius High School in Cleveland, Ohio, Bambic has submitted two first-author journal articles for publication and presented his research at four conferences. He was named a 2017-18 Philip Merrill Presidential Scholar and was inducted into the Sigma Pi Sigma physics honor society. 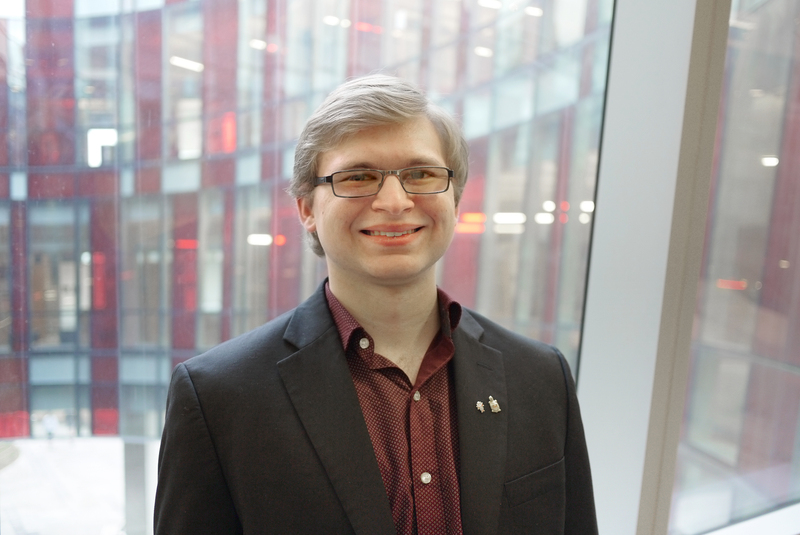 He serves as president of the AstroTerps student astronomy club, is a member of the Society of Physics Students club, and tutors other students in physics and astronomy. He also volunteers his time in the local community through activities with the Catholic Student Center and the Knights of Columbus. The Churchill Scholarship will allow Khan, a 2016 Goldwater Scholar, to further his research efforts into programmed ribosomal frameshifting by joining the laboratory of Andrew Firth, a Wellcome Trust Senior Research Fellow at the University of Cambridge. “Yousuf is truly exceptional and ranks in the top 1 percent among the students I have taught and mentored at the University of Maryland,” said Zhongchi Liu, a professor in the UMD Department of Cell Biology and Molecular Genetics who invited Khan to work in her plant genetics lab while he was still in high school. 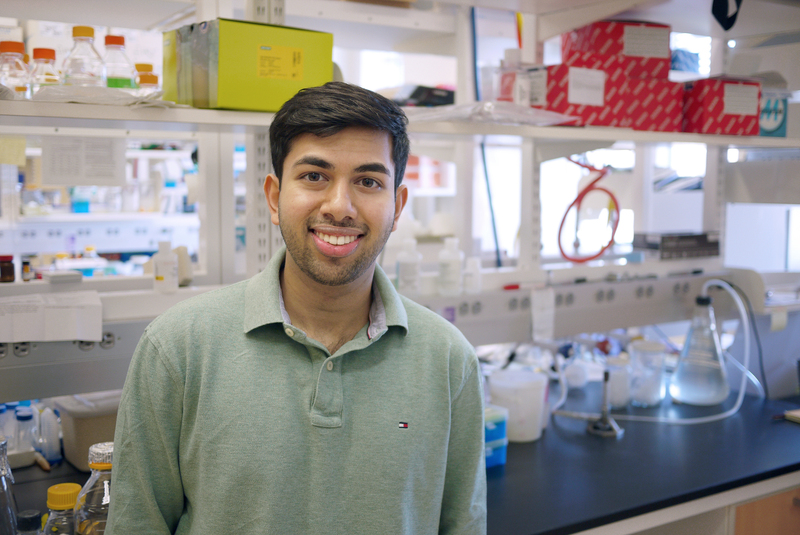 After enrolling at UMD, Khan spent three years in the laboratory of Jonathan Dinman, chair of the UMD Department of Cell Biology and Molecular Genetics, studying ribosomal frameshifting and how non-coding RNA controls gene expression. Khan cloned sequences suspected of being able to reprogram the genetic code and determined whether the sequences had the frameshifting function. As a result, he validated several new frameshifting sequences and co-authored five peer-reviewed journal articles and spoke about his findings at the American Association for Cancer Research’s annual meeting in 2017. “By targeting and manipulating these very basic, but important, molecular mechanisms, this research could lead to the development of therapeutics to combat diseases and to mitigate the effects of aging,” Khan said. To broaden his research experiences this year, Khan joined the laboratory of UMD Department of Cell Biology and Molecular Genetics Professor Norma Andrews to study Leishmania parasites, which are found in parts of the tropics, subtropics and southern Europe. They can cause serious disease and even death. Khan is examining the role of iron and reactive oxygen species in regulating differentiation of these parasites. He co-authored a peer-reviewed journal article detailing how to infect macrophages with these parasites and is preparing to submit a first-author publication. “Yousuf’s scientific thought process is mature beyond his years and easily rivals that of entry-level postdoctoral researchers I have met,” said Khan’s mentor Bidyottam Mittra, an assistant research professor in Andrews’ lab. A graduate of Winston Churchill High School in Potomac, Maryland, Khan received a Howard Hughes Medical Institution Research Fellowship, the Dr. Norman Laffer Scholarship and two Maryland Summer Scholars research fellowships. He has served as a teaching assistant for genetics, physics, and organic chemistry courses as well as the First-year Innovation and Research Experience (FIRE) program. Khan serves as president of the Pakistani Student Association at UMD; he previously served as vice president of SHARE (Supporting Hospitals Abroad with Resources and Equipment) and vice president of the tennis club team. He has also been a member of the Science Enrichment After School tutoring program and the Student Government Association’s Health and Wellness Committee.